As noted yesterday on CAMERA’s Snapshots blog, the influential wire service initially did not attribute this figure to any source, but stated it as fact. The number is a Palestinian (Hamas) claim, disputed by the Israeli Meir Amit Intelligence and Terrorism Information Center, which has documented that eight of the 17 on the Hamas list were Hamas and Palestinian Islamic Jihad terror operatives or worked for Hamas or Islamic Jihad media outfits. About a week after the end of Operation Protective Edge the Palestinian Journalists Syndicate issued a list of 17 names, allegedly of journalists who had been killed in [the summer 2014 Gaza] operation. The list was published by the PA’s Wafa News Agency, which received it from the Hamas-controlled Gaza office of the ministry of information. The Hamas-run ministry of information said 17 journalists were killed covering the July-August Gaza war . . . .
That statistic is disputed by the privately run Israeli Meir Amit Intelligence and Terrorism Information Centre, which says Hamas-linked media operatives or combatants were counted as journalists in Palestinian figures. The International Federation of Journalists says at least 13 media workers were killed. It should be noted that the International Federation of Journalists’ (IFJ) list of 13 journalists killed in Gaza last summer includes several whom the Meir Amit center has identified as operatives of Hamas or Islamic Jihad. 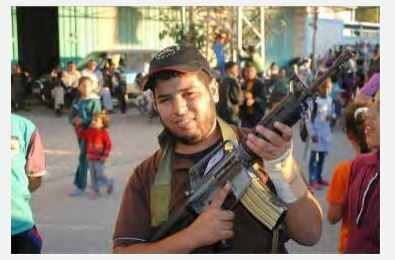 Among them is Izzar Dheir, killed July 29, and shown below (photo courtesy of Meir Amit center) wearing an Islamic Jihad cap and holding an M-16 rifle. So your argument is it’s OK to exterminate them because they want to exterminate us? And do you claim the moral high ground? Personally, I find your attitude as sickening as any antisemitic tripe on PATV. Obviuosly he means it, and I partly wronged you. My apology for this, but not for the critic of the comparisons.